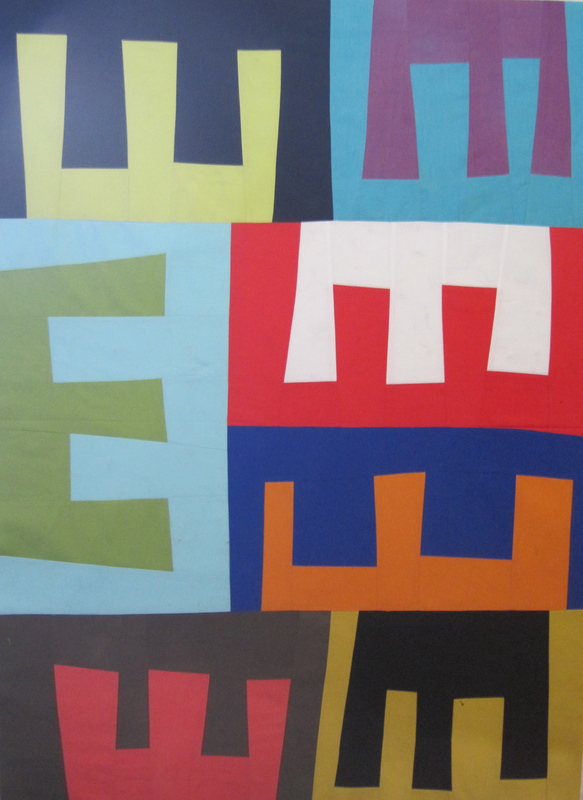 It can be tedious searching through old photographs trying to figure out exactly when I started a quilt, but it is totally worth it in the end. I like tracking down this history and sharing it with you. 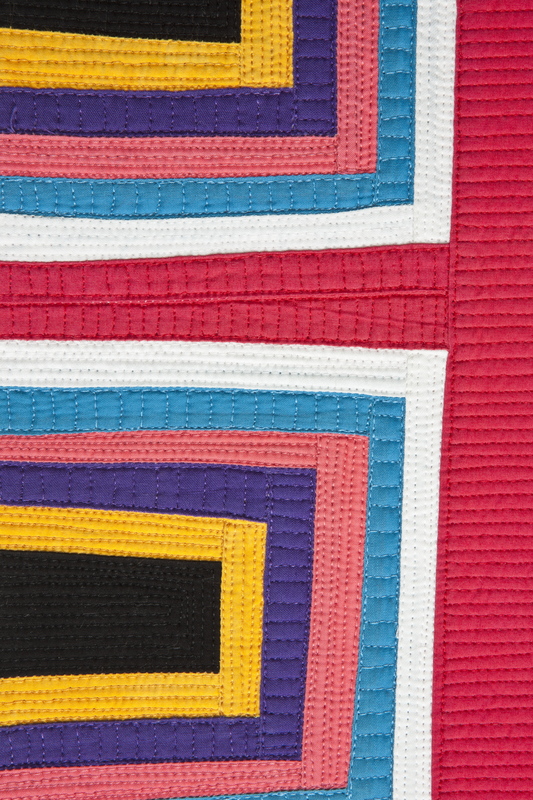 Many of my quilts are years in the making. They go on and off the design wall for assorted reasons. I can’t figure the quilt out. I’m on deadline for another project. 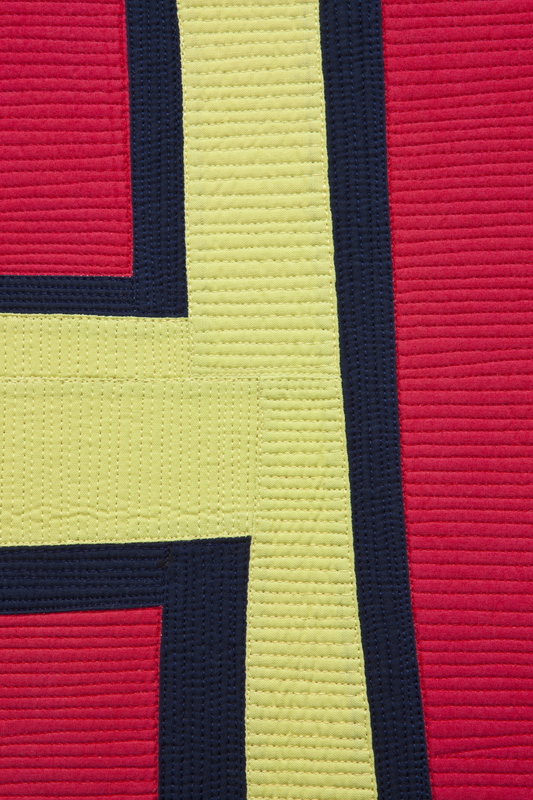 Another quilt demands to be finished first. Life stands between me and my sewing machine. Now that I’ve started documenting each quilt’s history, the pile of unfinished work doesn’t bother me as much as it used to. As time passes, I see that I do finish many of the best ones. 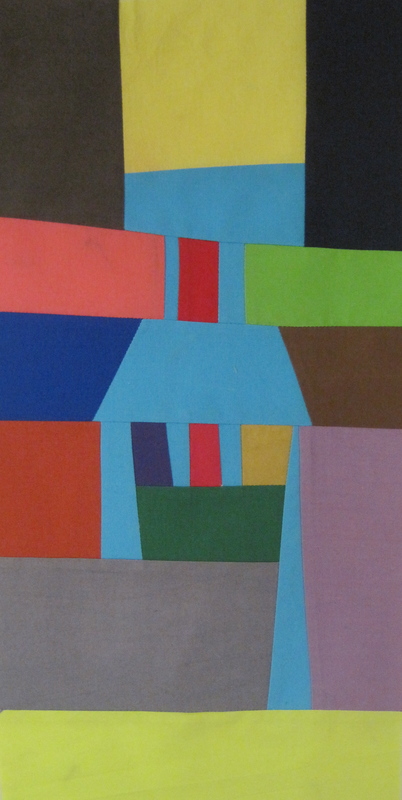 In the spring of 2012, I signed up to take Lisa Call’s online class Abstraction. 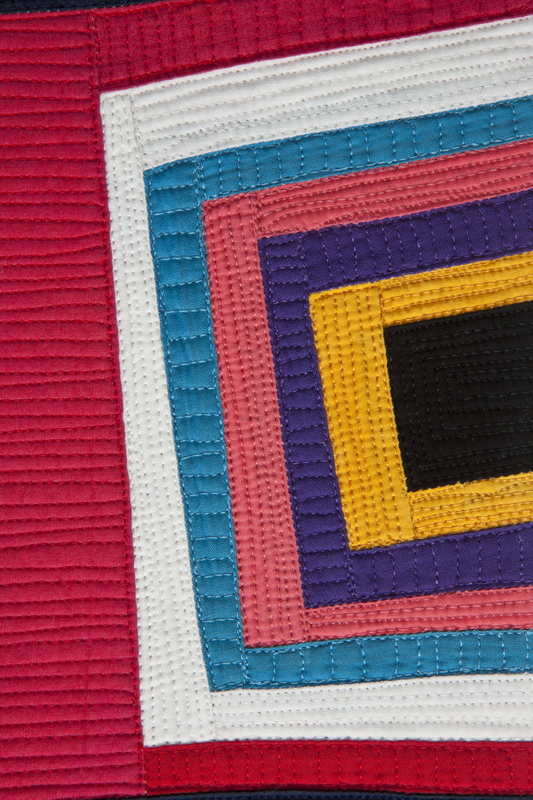 I had just finished her Working in a Series class where I had focused on making chair quilts. 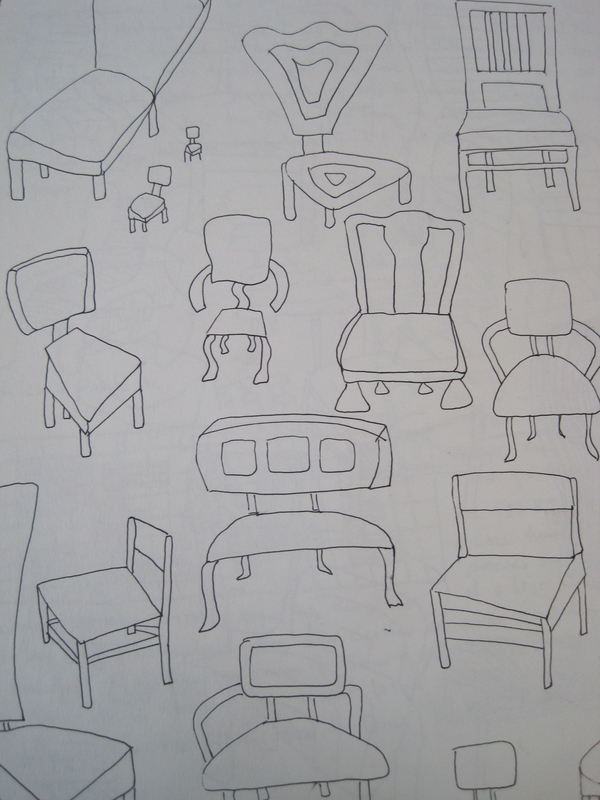 I did not know at the time that one of the hardest things to draw is a chair! Drawn chairs need to look like you could actually sit down on them. 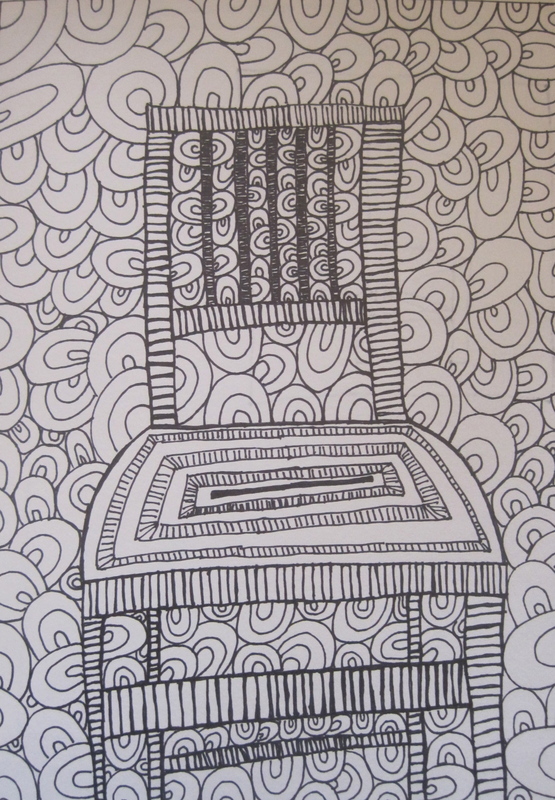 I really wanted to create a crazy pieced background with a crazy pieced chair. I still want to do this. Someday. Lisa didn’t pay me a cent to say this, but it is true. Lisa Call is the most supportive teacher I have ever had. Her classes get you moving forward with your artwork in a big way. And totally by coincidence, you can still get the early bird special on her fall classes if you sign up by July 31st. For the Abstraction Class, I decided to keep working with chairs. Chubby, clunky chair legs. Franken Chair. 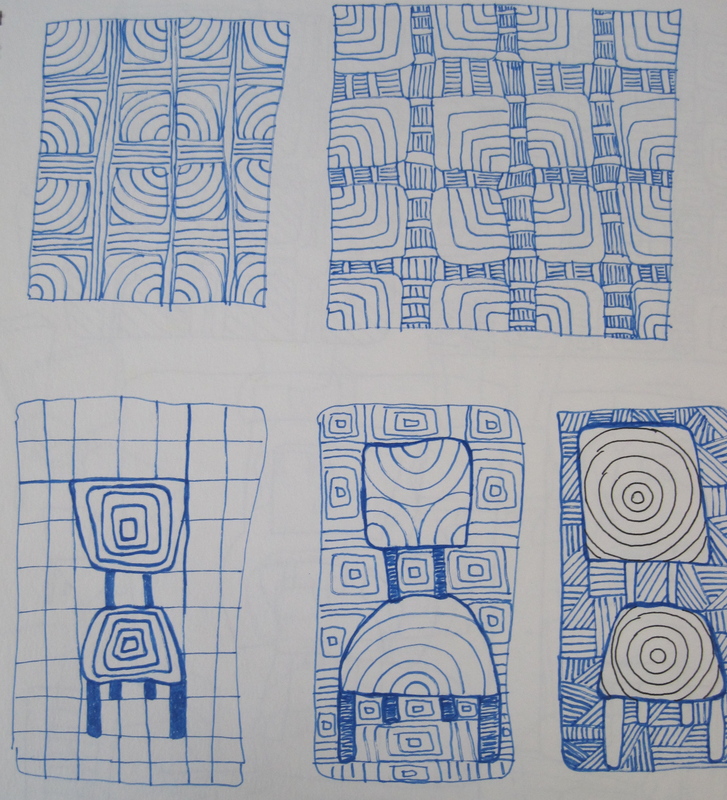 Klee Chair. I can’t believe this, but I actually ripped this apart. And now I want to put it back together. Good luck with that. Note to all of you. Don’t destroy mediocre work. Shove into a storage tote. It may get better with age. Plus, it’s part of your story. And Berry Picking. What? I know. This piece doesn’t look like a chair at all. 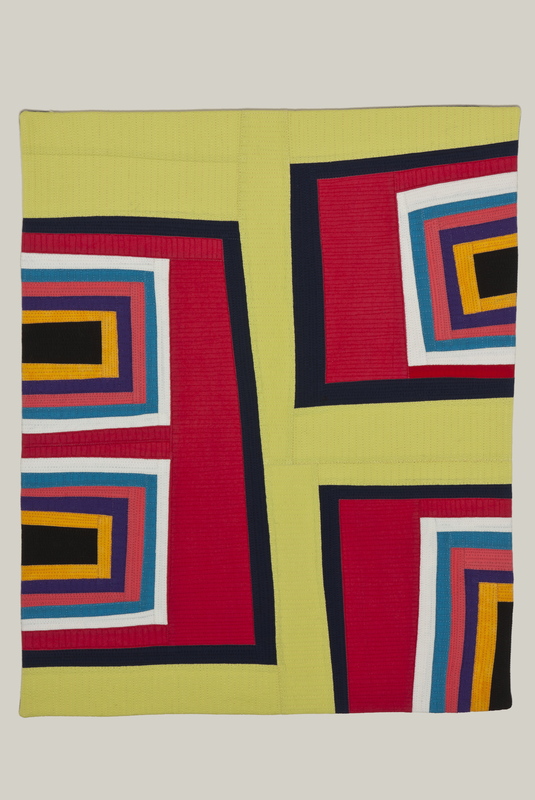 This quilt looks like Fruit Salad. And Boulevard. 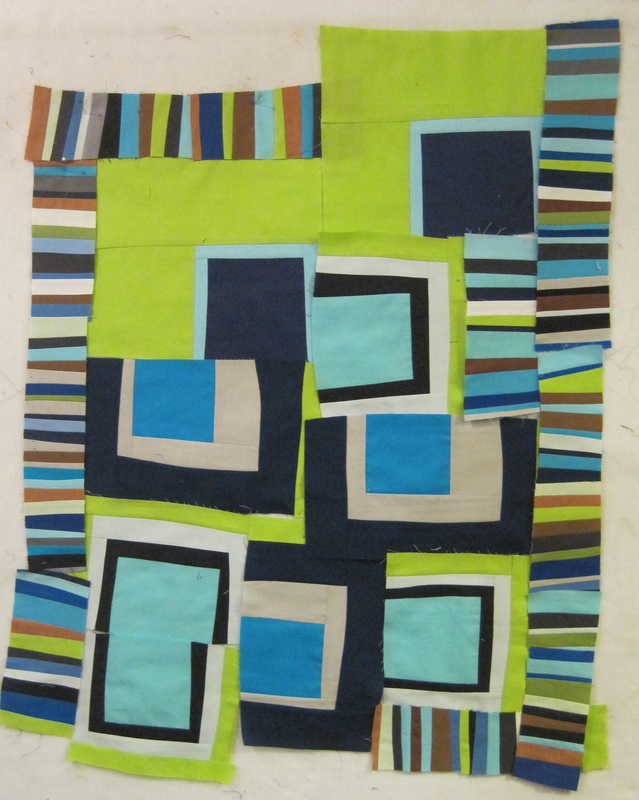 And Unfinished Blue Quilt. 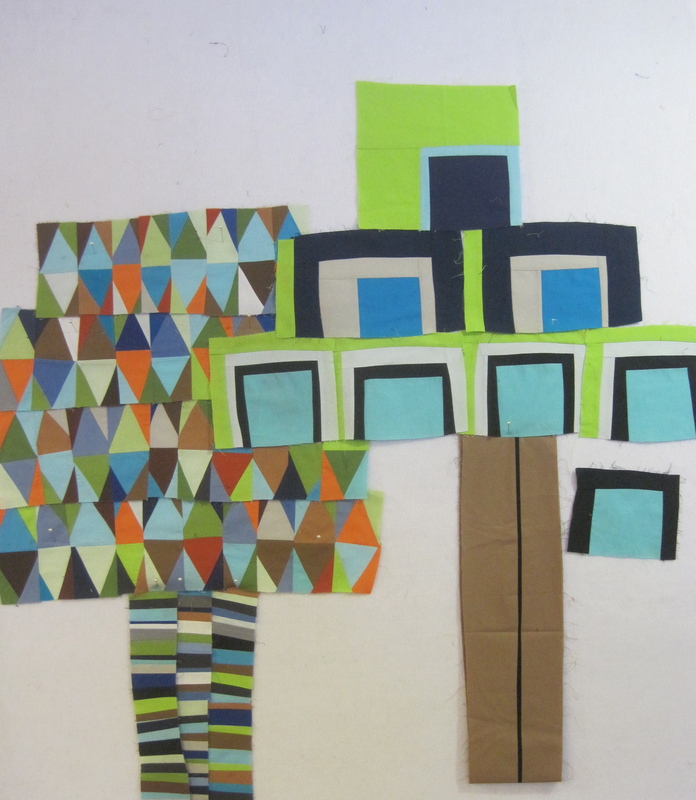 Which might become a tree quilt. 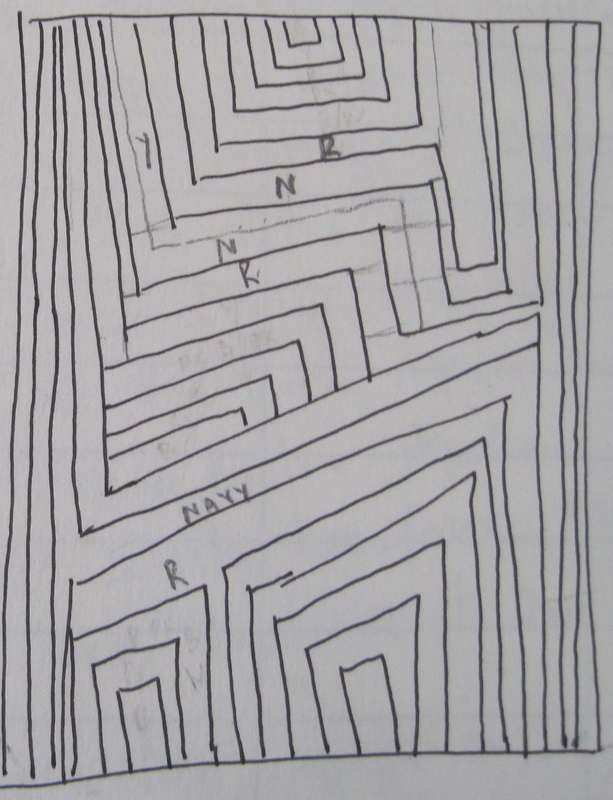 But it really is based on this sketch. One of the things I love about Berry Picking is that the detail shots look like mini-compositions. The quilt is small so once the hanging sleeve and label are on, there is not much quilting to look at, but I know you all like to see the backs of quilts–I do too. And now for the very best thing about Berry Picking. Feel free to use your finger tips to create a drum roll. 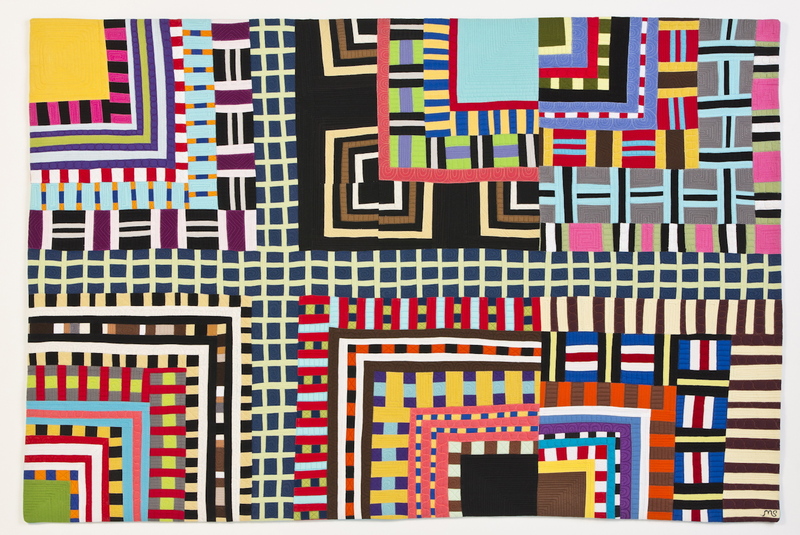 The Alaska Contemporary Art Bank (ACAB) purchased this quilt for their collection! The ACAB is a lending collection comprised of artwork by Alaskan artists. It was created to serve as a lending library. State of Alaska agencies and departments, legislative offices, and the university system can check art work to display in their offices and buildings for the general public to enjoy. Since 1975, the ACAB has acquired 700 pieces of art. From the 300 pieces submitted this year, ACAB purchased 11 new works and Berry Picking was one of them. Happy Friday Folks! That means its Off the Wall Fridays. Check it out. 13 Jun	This entry was published on June 13, 2014 at 4:34 PM. It’s filed under Quilt Stories and tagged Berry Picking. Bookmark the permalink. Follow any comments here with the RSS feed for this post. Thank you for the idea. Sometimes I use a “one inch window” to look at photographs for inspiration, but I had not thought of an L-shape. I will definitely give that a go. It’s more work, but the end result is worth it to me. I’m glad you like the idea. So many congratulations Maria… your work, (and yes, Berry Picking is an excellent choice,) belongs in the important collections and I am slowly learning from you how important it is to take our art seriously and to cherish my creativity as a sacred trust. I will be watching, learning and waiting to hear about more acquisitions. I would love to run across a small M. Shell piece I could afford to add to my collection now before you are too famous! Bethany- thank you for all those kind words. It’s interesting that the more we give ourselves time and freedom to create the more creative we are. And the emotional, psychological, and health benefits of doing that are pretty good too. As I was writing Berry Picking, I was thinking about finishing a grouping of small quilts and selling them. I will let you know! Thank you! Your work is like candy. Great inspiration. Love your exuberant colors and designs! Congratulations on the sale! Thank you Terry! Color is my frenemy. I love working with color, but it is rarely an easy job. What wonderful work you do. I love your chairs! Thank you Charlotte. I love the chairs too. Someday I will get back to making more of them. Congrats on Berry Picking. Home now after 3700 miles of driving from Michigan, Kansas City, Boulder and them the long way home. Stopping at Paducah for the second time was the highlight of the trip other than seeing Sue, Julie and families and Big Ben do his thing. You MUST get to Paducah. Remarkable exhibits that change every three months. Collection of prize winning European/British stuff and the most remarkable miniatures to die for and hope to never try for such a challenge. Jerry waited on a bench under a tree. I couldn’t even taunt him with “You are too intelligent to deprive yourself from this museum. ” He spent the hour at the Louvre in the same fashion so I saved my breath but gave him a cursory hug for stopping anyway. Congrats on Berry Picking. Home now after 3700 miles of driving from Michigan, Kansas City, Boulder and then the long way home. Stopping at Paducah for the second time was the highlight of the trip other than seeing Sue, Julie and families and Big Ben do his thing. You MUST get to Paducah. Remarkable exhibits that change every three months. Collection of prize winning European/British stuff and the most remarkable miniatures to die for and hope to never try for such a challenge. Jerry waited on a bench under a tree. I couldn’t even taunt him with “You are too intelligent to deprive yourself from this museum. ” He spent the hour at the Louvre in the same fashion so I saved my breath but gave him a cursory hug for stopping anyway. I do so hope to get to Paducah and see the exhibits. Someday. Someday. I’m glad your road trip adventures were good! Being creative is a wonderful trait and even if it is not directed to artistic endeavors, the problem solving capability is good for any pursuits in life. Sometimes it is hard to decide which direction to take but I am sure the competition among the boys has been good too. Mine ended up a surgeon, attorney and engineer. They competed in sports be different ones from each other too. Kept peace in the family and Jerry and I hopping. Hard to believe they are middle aged! My coworker pointed me to your blog. 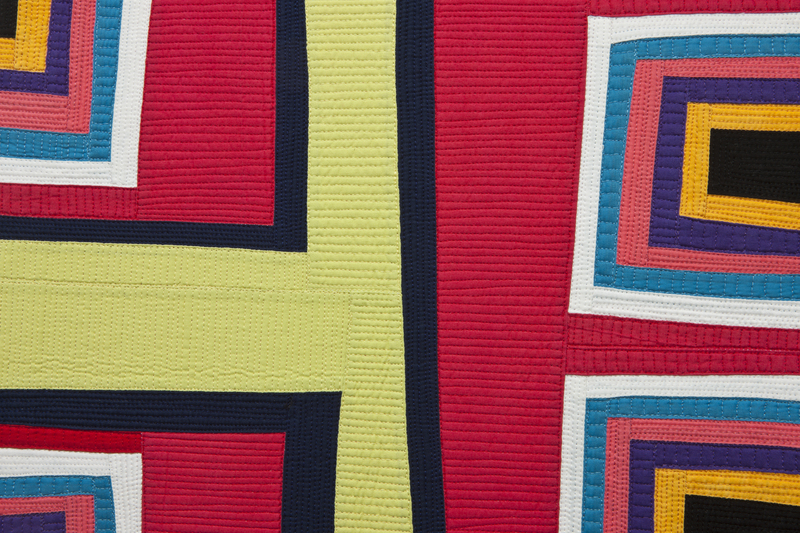 I am in year three of a massive project to document my mother’s quilts and now have had about 300 of them professionally photographed only have about 20 up on the website. She kept a lot of notes about when she started them, when she stopped, etc. but she wasn’t as good at labeling the quilts so it has become a fun sleuthing effort to match up the actual quilts with their names. 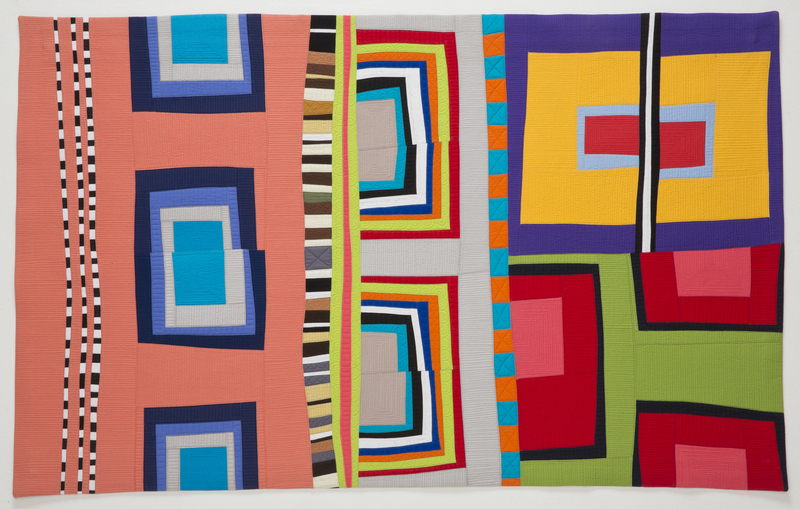 Mom did a few chair quilts, too – I love yours; they are so whimsical and colorful. My mother was known among her quilting friends as one who liked “muddy” colors. Blythe- Your mom was a major source of inspiration to me when I first started quilting. I took a very long bus ride in Juneau just to get her to sign one of my books. I’m glad you are taking the time to document her work. She is a quilting treasure. Contrats on Berry Picking’s purchase. What an honor. Enjoyed the rhetoric about designing the piece. Interesting how different yet alike our artistic brains work and all of its distractions along the way to a goal. You are a talented gal and I am curious to learn what creative genes are passed along to your boys as they mature and gel their careers. We obviously both come from artistic people so it should be interesting. Carole– All the boys are creative. Son number one is a stand up comedian, son number two a drummer–he is in three bands right now, and son number three wants to be a film maker–he currently creates lego stop motion battle scenes. We will see if any of them have tenacity to make it a reality. Yes. we have good creativity genes on both sides! I always tell people Walt’s mom is an artist, so he didn’t know better when he met me.